We stopped in to see Powell's Repair Technician, Rachel Baker, earlier this week. As usual, she was working on COAs and overhauls, but we happened to see one very interesting drawer open in her supply organizer... It was a drawer full of corks of all different shapes and sizes. What are all these for? We had to find out, so we asked her! 1) Tenon corks: These are found on piccolos and wooden flutes. A tenon cork is a strip of cork that surrounds the tenon completely. It's used to hold joints together. 2) Bumper corks: Bumper corks are found on the D# key and trill keys. A bumper cork is a piece of cork under the key that keeps the key from hitting the body. 3) Adjustment corks: Adjustment corks are very small, thin pieces of cork that are used to help the keys work together. They are found more often on pinless flutes because of the way a pinless mechanism functions. 4) Piccolo tail corks: Piccolo tail corks are small, narrow pieces of cork that are affixed to the key tails on piccolos. They control key height and keep the tail from hitting the body. 5) Headjoint corks: Probably the first cork that comes to mind when we think about flutes. These are larger, cylindrical pieces of cork in the headjoint. Their purpose is to seal the air, and their placement controls intonation between octaves. The various corks mentioned above are actually all the same -- it's just that the cork is cut into different shapes and sizes depending on what the cork will be used for on the flute or piccolo. Obviously, a sheet of cork is easiest to use when making corks for tenons, key tails, and adjustments, but it would not work well for a headjoint cork! You can see the different shapes and sizes in the photos below. 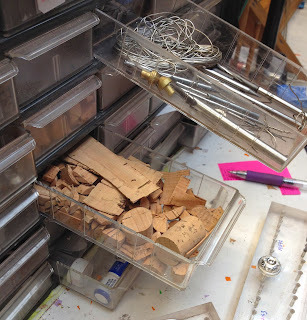 Drawer of corks -- all different shapes and sizes. Another drawer -- these are mostly used for piccolos. Corks for different purposes. Left to right: headjoint, piccolo tail, bumper, tenon, adjustment. Large sheet of cork can be cut into smaller pieces for various uses.